January 30, 2017, 12:04 PM · In an effort to promote the coverage of live violin performance, Violinist.com each week presents links to reviews of notable concerts and recitals around the world. Aisslinn Nosky performed Mozart's Violin Concerto No. 3 with the Handel and Haydn Society. 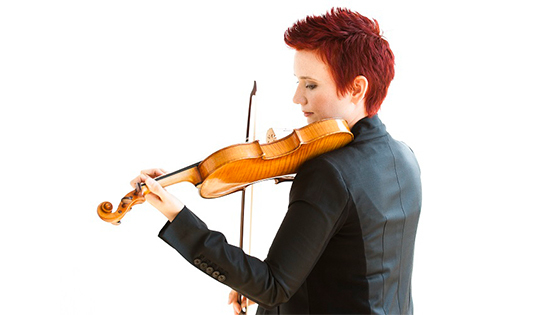 Boston Globe: "Watching concertmaster Aisslinn Nosky perform was akin to watching an expert circus artist climb, contort, fly through the air, and stick her landing. The sheer virtuosity, dexterity, and communication required for the violinist to lead Mozart’s Violin Concerto in G Major was evident in the score, but looking at Nosky, one would have thought she spent no effort steering the orchestra and conjuring colorful cadenzas, doing it all with a smile." Aisslinn Nosky. Photo by Sian Richards. Itzhak Perlman performed works by Vivaldi, Beethoven and Stravinsky in recital with pianist Rohan De Silva. The Orange County Register: "Perlman and pianist Rohan De Silva delivered the goods with offhand intimacy and a refreshing lack of stuffiness, as if they were playing in someone’s living room." Anne Akiko Meyers performed works by Pärt, Lauridsen, Rautavaara, Ciupinski, Beethoven and Ravel in recital with pianist Wendy Chen. Richmond Times-Dispatch: "The newer music was the real attraction of this program. Surprisingly, given the traditionalist tastes of many who attend VCU’s Rennolds Chamber Concerts, the contemporary pieces were applauded warmly." Valeriy Sokolov performed Prokofiev’s Second Violin Concerto with the Bournemouth Symphony Orchestra. The Guardian: "Sokolov’s performance was immaculate technically, but too seemed to be disengaged and risk-free." Joo Yeon Sir performed the Brahms with the Isle of Wight Symphony Orchestra. On the Wight: "She was electrifying, and absolutely in command of the concerto right from the start." Katherine Winterstein performed the Barber with the Vermont Symphony Orchestra. Rutland Herald: "Winterstein not only managed the virtuosity, she proved most expressive in flowing lines of the first two movements." Pinchas Zukerman performed the Beethoven with the New Jersey Symphony Orchestra. NJ.com: "In his solo work, Zukerman brought the same relaxed, seemingly effortless style to Beethoven that he brought to Tchaikovsky in his concerts last weekend."